NEW YORK (CNN) -- A 26-foot-long dying shark washed ashore Tuesday on a Long Island beach, the New York State Office of Parks, Recreation and Historic Preservation said. 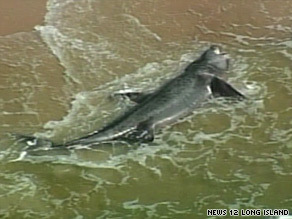 The basking shark that washed ashore on Long Island, New York, on Tuesday was 26 feet, 6 inches long. Basking sharks can grow up to 35 feet in length and are the second-largest fish in the oceans after the whale shark, Marcus said. This particular species spends the summer months off America's Northeast coast and then migrates to the warm waters off South America for summer in the Southern Hemisphere.